This is part one of our series on the role of philanthropy to preserve endangered native languages by resourcing indigenous-led groups that are on the frontlines striving for cultural survival. In the face of an enduring assimilation narrative, indigenous-led groups across the U.S. are revitalizing their languages and culture. Sacred Fire Foundation has prioritized funding language preservation programs, a recognition that preserving native languages is key for cultural survival. Last year, the Foundation funded an innovative group that is revitalizing the Lakota language in the Pine Ridge Reservation. Lakota Immersion Childcare (Iyápi Glukínipi) is the first full-immersion early childhood daycare in Lakota Country. This program is pioneering on many fronts: the Lakota language is critically endangered, with less than 10% of fluency among tribal members in Pine Ridge reservation. Peter Hill, founder of the group, had a vision for the youngest tribal members to have an earliest start possible to speak their Native tongue. The program began in 2012 with five children at a daycare center in Peter’s house and today serves 20 children in a center loaned by a generous community elder. Peter shares that the average age of a fluent speaker in the reservation is 68, with very few fluent speakers who are younger. “The parents have made a deliberate choice to send their children to this daycare. One family drives 90 miles to come here,” he shares. The daycare center starts young, with 18 months-old toddlers to give them a head start to speak Lakota. “Much of the culture was lost by colonization, and over the past several decades it has been revitalized by bringing back ceremonies. However, language revitalization lagged behind,” he notes. A five-member body called the Council of Lakota Wisdom Keepers advices the language nest. All five members are elders from the community, who are fluent Lakota speakers. 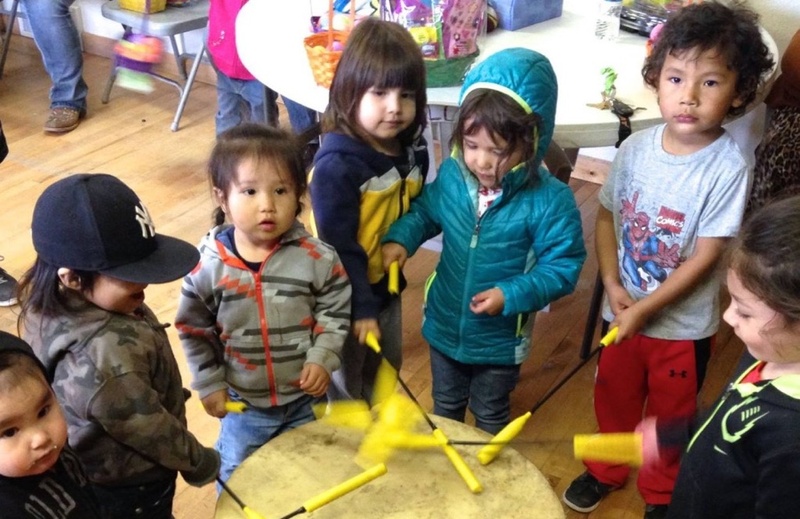 Over the years, the staff of Lakota Immersion Childcare has worked hard to build the curriculum, create resources and tools and integrate arts and crafts, songs, games and stories to teach Lakota. Audio games, apps, online and other multimedia tools are being developed and disseminated. Peter learned Lakota at the age of 23, and now speaks it exclusively with his young daughters. “It’s remarkable that this program has taken off. It started as in intangible dream, and every single day of the first year I wasn’t sure if our doors would be open the next day,” he shares. “Our early funders believed in us when we had low capacity.” And they have come a long way. Their team is eager to share more language resources in the community, and would like to expand their teaching programs to older children. “This community has struggled with the stigma of speaking their native language. A lot of shame was drilled into them.” Peter is heartened to see parents picking up Lakota as their young ones begin to speak, and a community is slowly piecing together the fragile strands of a language that was slipping away. To make a donation to Lakota Immersion Childcare, please click here. Also, if you wish to follow the updates of this wonderful group, please become a fan of their Facebook page!